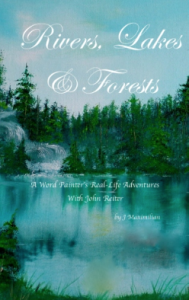 Rivers, Lakes and Forests by J Maximilian, is a sampling overview of his writings from five different categories; most themed to the book’s title. Minnesota’s wilderness areas and the Canadian ‘bush’ have led the author’s deep appreciation for life’s living. Selected writings from each category in Rivers, Lakes and Forests, include short stories, adventures, poems, and prayers. All are linked with Nature’s beauty and most with non-religious spirituality. Each writing is part of the author’s real life experiences; and indicative of Mr. Maximilian’s intuitive style of ‘Word-Painting’…imagery through words. This entry was posted in Maximilian Books. Bookmark the permalink.